Overwatering tomato plants is a fairly common error for gardeners to make. A tomato plant that has been overwatered will have lush, green leaves but will not produce much fruit. Overwatering can also weaken the root system, depriving it of oxygen. It's easy to overwater a tomato plant if you tend to it at the wrong time of day and do not take cues from the soil moisture and drainage. Knowing what not to do can help gardeners avoid most fatal errors. Fail to check the dirt before watering your tomato plants. 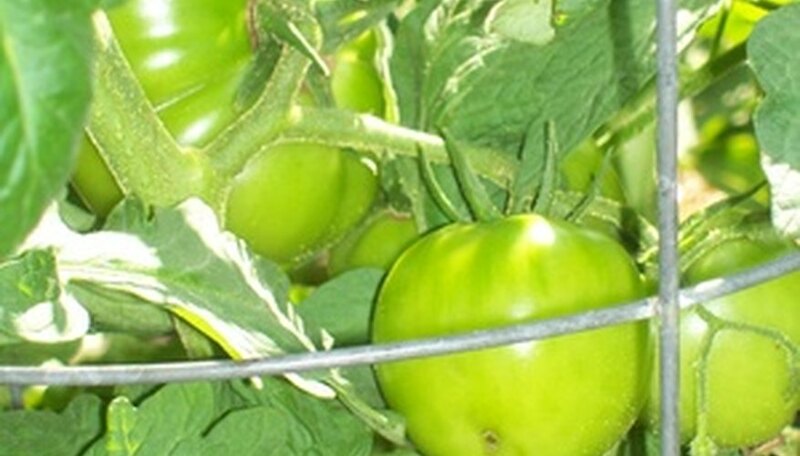 Tomato plants' soil should drain thoroughly between waterings. If it is more than slightly damp, the plant is likely already overwatered. Do not water plants that have soaking soil. Water the plant after water no longer drains into the soil. If standing water remains on the surface of the dirt after you're finished watering the tomato plant, that means it has been overwatered. All moisture should absorb into the soil within seconds. Water the plant from above using a hose with a spray nozzle. When you do this, you not only soak the tomato plant (which is bad for the leaves), but you also risk overwatering. When the water has to drizzle through the leaves and branches of the tomato plant before it hits the dirt, you're likely to give it more moisture than it needs before you realize anything is wrong. Care for the tomato plant in the late afternoon or early evening. Tomato plants require a strict schedule, and it's best to water them in the morning so the wet soil has a chance to heat up and allow some of the moisture to evaporate throughout the day. Give plants more than 2 quarts of water per day before the first harvest and more than 4 quarts after. This is the maximum amount of water any tomato plant should require; anything extra is considered overwatering. If you're having a problem with the soil drying out early in the day, try spreading a thick layer of mulch around the base of the plant as opposed to watering it more. Water tomato plants after it rains. During the summer, storms may take care of your job for you, and overwatering will result if you give them their usual ration on top of the rainwater.